"I don't want to be rich and respectable! I want to be just like the rest of you!" Stars: John Wayne, Dean Martin, Michael Anderson Jr. When her funeral brings The Sons of Katie Elder back to Clearwater, Texas, local businessman Morgan Hastings (James Gregory) makes it his business to ensure that the "boys" learn nothing of the means by which the family ranch fell into his hands. He hires a strong-arm gunfighter named Curley (George Kennedy) to make sure that John Elder (John Wayne) and his brothers Tom (Dean Martin), Matt (Earl Holliman), and Bud (Michael Anderson Jr.) are kept safely at bay. When Hastings' machinations lead to the death of Sheriff Billy (Paul Fix), the "Elder Gang" must fight to clear the family name so that Bud can go to college and amount to something. Director Henry Hathaway pulls out most of the western clichés here, employing grizzled old blacksmiths for atmosphere, corrupt deputies for villainy, and a comely boarding house owner (Martha Hyer) for a little eye candy when the plot slows down. The studio's desire to populate the film with recognizable stars requires some biological-clock-defying activity on the part of the late Mrs. Elder, who apparently bore children for 36 years - John Wayne was 58 when he played oldest brother John to youngest brother Bud (Michael Anderson Jr., 22). And the film gets off to a slow start, as the Elder boys take a good couple of reels to figure out that something's rotten in Clearwater. Fisticuffs and pyrotechnics are presented competently, but as western action goes, this is a fairly generic example of the breed. Fortunately, The Sons of Katie Elder has other qualities to recommend it. The Elder family has a rich backstory of sons who abandoned their mother to an alcoholic, gambling-besotted father and lived to regret it. As the story develops, we learn that she insisted her boys could do no wrong, sending her money and letters, even as John and Tom drifted aimlessly across the plains, wanted for petty crimes and murder. The Elder sons are a cantankerous lot, bickering and brawling amongst themselves, and this gives the actors considerable room to stretch. Dean Martin is funny and naturalistic in a manner unseen in the Martin-Lewis comedies, and John Wayne trades his traditional machismo in for an older, wiser persona, even cracking a smile now and then. George Kennedy is surprisingly over-the-top as the sadistic Curley, and a young Dennis Hopper plays Hastings' paranoid son with a hint of the edginess for which he would later become famous (one keeps expecting him to open up a can o' profanity on The Duke!). The film plays games with our sympathies as well - James Gregory's Hastings is initially presented as a mild-mannered homesteader, becoming more and more snakelike as the story develops. The Sons of Katie Elder is ultimately the story of estranged brothers finding their sense of family again. It's been done better, before and since, but the Hollywood cast and western milieu provides some novelty appeal. It's not a masterpiece, but it's worth a spin. Image Transfer Review: Paramount presents The Sons of Katie Elder in its original 2.35:1 widescreen theatrical aspect ratio, doing proper justice to cinematographer Lucien Ballard's panoramic, deep-focus outdoor photography. The source print is incredibly clean for a film of 1965 vintage, with just a few dust and damage flecks, and the single-layer anamorphic transfer features solid color and shadow detail. The transfer exhibits more edge enhancement than it ought to, compromising fine detail in many scenes with a slightly "video-esque" look. But the film itself is in fine condition, looking better than many productions of more recent origin, and the DVD image is impressive. Audio Transfer Review: The Sons of Katie Elder retains its original monophonic audio, presented in Dolby Digital 2.0 format for ProLogic decoding to the center channel. The audio quality is very good, with clear dialogue and foley effects and adequate frequency range for Elmer Bernstein's orchestral score. There isn't any significant bass activity, but this is a high-quality vintage audio track, competently transferred to DVD. The alternate French-language track suffers from an extremely "studio-dubbed" quality, especially where le Duc is concerned, and the track sounds clipped and surprisingly muddy compared to the English original. Extras Review: The range-riders at Paramount failed to lasso any significant extras for The Sons of Katie Elder, just 16 picture-menu chapter stops and the original theatrical trailer. The trailer is fairly "modern" in its approach, opening with music and on-screen text over clips from the film, then segueing into key dialogue bits. It's grainy in a few spots, and the 1.85:1 ratio trailer pans-and-scans the 2.35:1 original, but it's a valuable piece of the historical record. 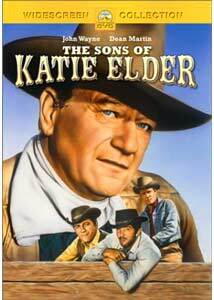 The Sons of Katie Elder is an atypical western picture, paying more attention to interpersonal relationships than to its good guy/bad guy plot, despite the larger-than-life presence of John Wayne. Paramount's DVD features a fine transfer, though supplements are few; still worth a rental.